Before I went on our geological field studies trip, I thought that by some strange coincidence, paleontologists would just be walking along a random plot of dirt and find T. Rex skulls and bones poking out of the ground, kinda like this 60’s paleontologist guy below. How wrong I was! I had no idea how much work and effort a paleontologist puts into finding dinosaur fossils. I found the whole excavation process very fascinating, and so that’s what I will teach you about. Before a paleontologist even begins digging, he has to survey the area he’s working in, and see if anything promising can be found. Fossils are found in sedimentary rock layers, and the layer we did our work in was the Wahweap Formation. A paleontologist surveys and prospects for fossils while hiking along the bases of hills and such. Fragments of fossils erode out of the ground and tumble downhill, so if any fragments are found at the base of a hill, you search up the hill to find more! After identifying what has been found (if anything) and if it was actually a fossil, the paleontologist has to decide if it would be worth time and resources to pursue an attempt to excavate any fossils from the ground. On public land, permits must be obtained from the appropriate agency, such as the BLM or the Forest Service, before an excavation can begin. 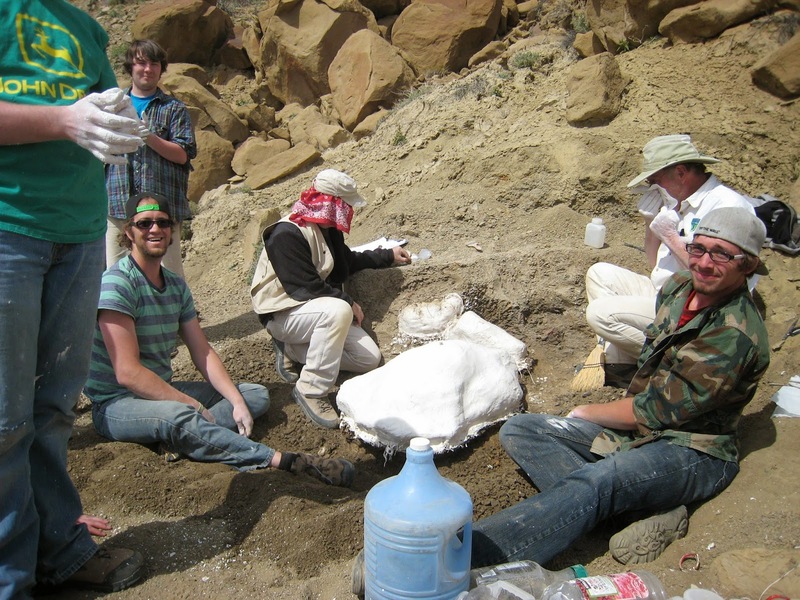 Once a permit is acquired, the paleontologist heads out with an excavation team and begins work. It involves a bunch of digging with shovels and picks until the bone layer is found. 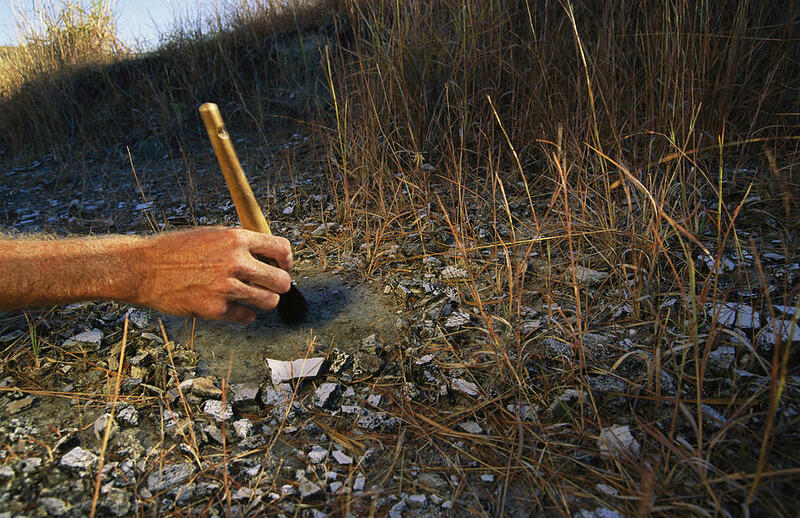 When the bone layer is found, the paleontologist will use only small hand tools and brushes to carefully isolate fossils. Once the top of the fossil is exposed, hardener is put on the fossil, and then the fossil gets jacketed. The jacket involves lots of wet paper towels and strips of burlap soaked in a liberal amount of Plaster. The jacket sits until it is firm and solid. However, this is only the top of the jacket. Now the paleontologist digs under the fossil and layer of dirt and applies more jacketing material. When the bottom is solid enough to hold the jacket in place, the jacket is flipped over and brought out of the dig site to the lab. Pictured below is a large jacket being removed by an excavation team. This is the process a paleontologist uses to excavate a fossil, and it’s totally not what most people think happens when fossils are found. I was glad I had the opportunity to go and learn about paleontology.